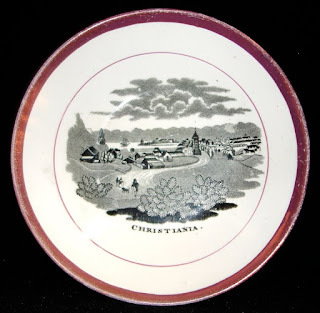 The purchase of a London-shaped cup and saucer with the image of a small city with the name "Christiania" introduced me to another learning experience. I had never heard of the city of Christiania. However, my husband David, who studied in Norway as a university student, informed me that Christiania was the former name of Oslo. Oslo was founded in 1048 by Harald III (1015-1066), but the city's name was changed in 1624 to honor Christian IV (1577-1548) who was king of Denmark and Norway. He rebuilt Oslo after a devastating fire, which earned him the popularity of the people, so the city was renamed Christiania. In 1925 the city's original Norwegian name of Oslo was restored. Christiania saucer impressed mark/R. 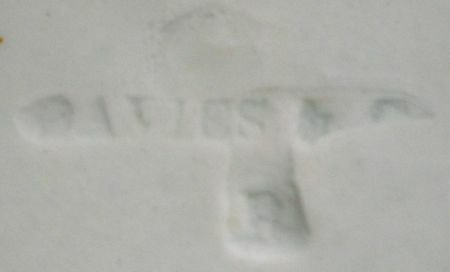 Davies & Co. The cup and saucer (notice the bowl-like shape), were made by R. Davies & Co. of the Tyne Main Pottery in Gateshead (1833-1851) in the 1830s. 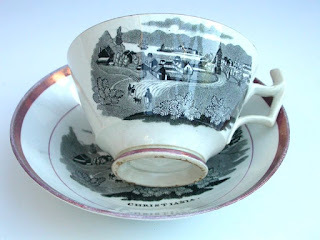 Most likely, this cup and saucer were made for the Norwegian market, as R. Davies & Co. did supply much pottery to Norway.